Where’s KYW 1060 News Radio? App is useless without access to news radio station KYW 1060. App deleted. For me that is an exit sign. I had been a loyal subscriber for years. Goodbye, KCBS! Very disappointed they got rid of radio streaming. No point of having this junk app taking up space on my phone now. Goodbye! Have no use for your "all seeing eye" app seeBS! I have an all hearing ear app that lets me listen to ALL the live stream radio that you removed from your, now, crAPP. Deleted. I listened to the local news every morning. With the removal of the radio stream, I have no use for this app and am deleting it. Disappointing decision by CBS, and one that lost them a loyal customer. I’d use this 5 Star app on a daily basis for WCBS 880 Radio, WINS, CBS-FM, WFAN etc. What happened to streaming CBS stations on my favorite CBS LOCAL app? What’s going on? Where did all my favorite stations go? No longer able to hear radio stations with this app. Goodbye. I’m very disappointed that they got rid of radio streaming. I liked that I was able to turn it on and go about my business. And, since we don’t have a radio, other than my car, it was a great option. So, you lost a loyal listener - who listened to all those advertisements in between! Ahem! I hope they decide to bring it back. It was a great and easy to use feature. Same as everyone else. Only used for the radio. Confused why it was taken away... Deleting as well. I used this app Dailey to stream the radio channels. Now I have no use for the app. Stupid decision! Get a real job. Just going solely after money must be getting boring. If not, maybe therapy can help you fit in to society. The rest of us don’t bite - for now. Greed does not end well. Save yourselves. To the rest of us, delete CBS from your lives. 😶 zero stars! The cancellation of streaming July 1 negated any purpose for the app.Was a3 now a zero! When they decided to no longer support live streaming local radio it became just another buggy app. I could stand the bugs to listen to the radio but now the crashes are no longer worth it. Don't understand why radio streaming was removed. Another good app ruined. Why delete the radio !!!!! That was what we all used up north!!! Bad review!!!! Why get rid of the best feature !! I could get the radio station anywhere even in Florida or at our cabin. I am so mad about this . I thought apps were suppose to get better and offer more not get rid of what people liked !!! 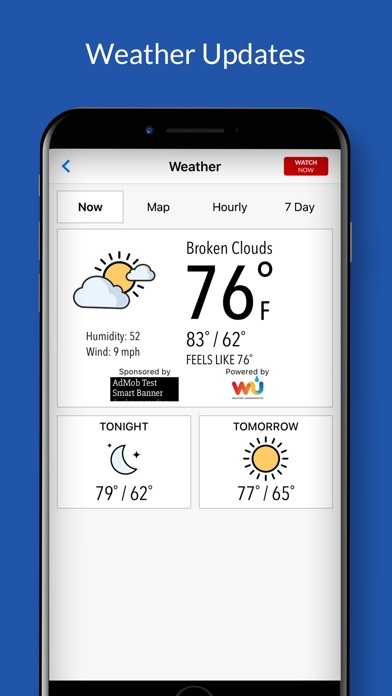 This app was great for many year when you could connect with several large cities to hear there news or music station , now they messed it up. The app , is now junk suggest you all delete it as a protest , deleted soon . App not good since they removed the live stream of the radio stations. Thanks for removing radio stations that I stream everyday to help me with Traffic! One star... can’t believe they removed the ability to stream radio stations that I use every day to help me with travel to work. STUPID DECISION! Removing app since I now have no use for it. Now I don’t have to listen to stupid commercials I can just use other non-CBS apps for traffic! radio streaming of KCBS was the only reason I used this app. Why did you remove the alarm function? Like to wake up to News Radio 88. Why did you remove the alarm function? This was my app to listen to my favorite radio broadcast but now the geniuses in power decided to remove that so what I need to use AM radio!!!!!! Get a clue morons! Miss the old CBS app. Can’t stream radio stations and Sports stations. Bummer. Try to see the news and, nothing! Last week the news was not updated for several days. Now the news (or any topic) does not display at all. The support function does not respond. The update no longer pulls in any news or info. Completely useless until it’s fixed. Had to download another news app until this is fixed. This app truly provides zero value. It hasn’t worked for three days now. When it was working, the layout of the app was confusing. I launch the app and no matter which sub heading I choose, I get nothing but a clickbait ad. No news, no sports, just clickbait ads with no news content. This app is very poorly designed. Kdka website very poor. Needs upgraded. This App has no content. I click on news and get a blank screen. Same for all other selections like blog entertainment weather etc. The old version was great and I preferred it to the other ones out there. Your new update is absolutely garbage! Nothing loads. You’re suppose to be the most watched news station in MN? Bring back the previous version. At least it worked! They changed the app and took away other CBS local radio stations. Now they only show TV stations. No Radio stations. Very disappointing. Now that this app is no longer able to broadcast radio stations, it’s worthless. May as well just delete it from the App Store. WTH - No More Radio Streaming? Streaming my local CBS radio station was my main reason for using this app. The latest update eliminated that. What’s up with that? I may as well delete it now. The only reason I used this app was because I used to like to stream local news radio when I was away. Now that’s gone. As for reading the news, the local “newspaper” apps cover it MUCH better. Going to delete it. This app has had so many problems! And now no radio? That’s it. The only point of having this app was the local streams. Without them it's useless. Moving them to the radio.com hot mess of an app is a joke. I guess I'm not a listener anymore. Why did you remove the local radio? That was the best part of the app. I could get KYW news from home while on the road. Just dropped the app, since you took out the best part. Good while it lasted. The most recent update July 2018 takes away the function to listen live to your local CBS station. Do not update the app to the newest version. CVS… What are you doing? I thought building business meant building customers. I guess I’ll just go to my other local station and listen to them live. Bye! Used to use this app everyday to listen to my radio stations on west coast. Now they stripped it from the new version. Lousy decision. I’m sorry. Gonna be deleting this app unless they bring back radio functionality. Shame on you cbs app developers. Big thumbs down! Did away with radio on app. Idiots!!! Bye bye app deleted!!! Don’t have time to watch, just listen. You lost me . Deleted this app. Bring back radio. Deleting the app. The only reason I got this app was to listen to WWJ radio on my iPhone since I don’t have a radio in the house nor a TV in my room where I get ready every morning. I want to know the traffic and weather before I leave. I’m so disappointed that it’s been taken away (why?). No use for the app now. 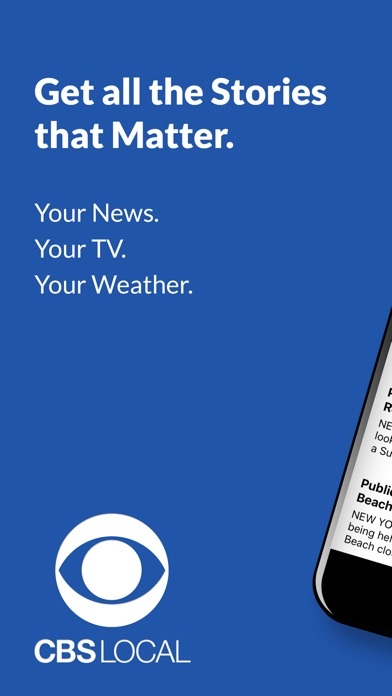 It is very disappointing that the app no longer allows one to listen to the local CBS affiliate. No reason to even use the app anymore which is why I deleted it from my phone. The only real value of this app was the ability to listen to your local stations and now that’s gone. You would think most media outlets would look for a way to increase their audience, but apparently some genius at CBS has found a way to reduce it. No more local radio ! Sad. I will be deleting the app. No use for it without the streaming radio. I used it all the time while traveling. Use to be able to stream my local radio station. Just sits on connecting. Have deleted it twice to if that would work. Not. Use to listen to WWJ am every day. No longer. While listening to the built in radio - when you open an article that has a video embedded (the video doesn’t automatically play) the radio cuts off. You can’t restart the radio until you move back to the list of news articles. 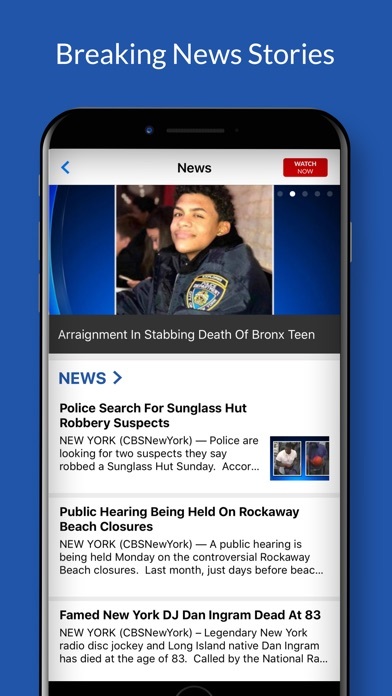 Even if you’re listening to another app’s radio, when you open a news article that has a video embedded the radio will stop playing. The video doesn’t even auto play-which I could understand would stop the radio from playing. 2 emails to support and no response. I’d say once or twice a month the app is problematic. During those times, I attempt to play a video (usually the weather report). The app crashes repeatedly. I attempt to submit a comment. The app crashes. Once the weather video crashed the app but the other videos played correctly. This app is better than coping with their website. That experience is worse. The ads tend to cause problems with the video player. That problem is more consistent than the app problem. Same articles have been on here for days and days despite new and important happenings that should be posted. Very limited in scope.not impressed. My radio station said “get the app to listen”. Wanted to listen to a short featured program while at the airport. No radio available on this app. Very disappointed. Will delete from phone. I just downloaded this app, despite the poor reviews. Endless advertising and bad links. As soon as I share this review, I will be deleting the app. Update: now it has video ads that automatically play loudly when you click on a news story. Great way to get me to uninstall the app. If you like listening to local news, you will be happier buying a radio. Didn't think the app could get worse, but now the commercials are cutting off the stories. Seemingly endless, repeated commercials from the same sponsors ruin the listening experience. App seems get postings later than competitors in area. The sister stations they cover is far less than acceptable in content and coverage. Seriously, no search feature?? I guess that’s not really needed when the app only serves a few stories in each category. Who ever thought that was good functionality (or lack there of)? Doesn’t work on my iPad. The most recent update for this app has seemingly removed all content. I open the app, select a section (multiple times - why? ), and there is no content. Don’t worry though, the ads still work 🙄 I thought CBS would be quick to fix this as it makes the app downright useless, but it’s been nearly 2 weeks and nothing. Used to be the best DFW news source but lately the local news is completely unavailable. I am a blind user of VoiceOver for iPad and iPhone. CBS Local is now largely inaccessible. I cannot find or listen to radio stations in Chicago: my city of choice, nor can I even contact the developer for support. They've made this worse. Site still shows 2 month old news articles. I enjoy this app. The news is important to me , and I like that I can watch it on the go. It is always clear and easy to use! This is crap! Does not work on iPhone or iPad. Screens are blank, but of course there are ads. But, no news or content. Have deleted and reinstalled 3 times with same result. I would hate to start using the ABC, NBC or FOX app. What happened to the written article?????! The app had been working fine other than it kept old old old news on the front page. Did not seem to update at all. The new app does not seem to have any written articles that I can read. Yes, I said read. I chose not to get the news by video I much prefer to read the news. I deleted this app because it’s useless without radio streaming. I also deleted my other CBS apps since none of them do me any good now. Just ditched this. When are the IT weenies gonna get some brass b#%} and tell the suites to LISTEN to people, to realize that you piss off your net base in the long run you lose. Love the twice daily video update in the app and on Alexa. CBS makes awesome local news. Total trash. 0 stars me." It seems that each version has less functionality than previous ones. Losing the streaming of the stations was a big deal. This latest version does not even seem to deliver the basics. Hoping it will be quickly fixed or will be deleting to create more room for other apps. The app worked fine before the recent update. Since the update, all I get now is a blank page. I wish you would go back to the way it was before the update. New and improved is not always better. About 3 weeks ago this app quit working. It shows the categories but there’s nothing there. I’ve sent them 2 emails about this issue but apparently no one cares. Why did you remove 98.5 the sports hub from the App? This would be great if I had only limited access to this app, and no other news source! Too much old, stale, moldy news. Just found this app will continue to use it. Traffic Map Still not fixed. WCCO NEEDS TO BE FULLY SUPPORTED. Not just CBS Minnesota. Develop CBS TWIN CITIES. No unsupported functions/glitches. It’s 2017. Mpls/St Paul is a major market. Couldn’t get in any news in the app. Couldn’t even contact support center. Please fix it. Notification for news! Cool. Click on it and oh wait, we really want you to watch the live news feed 15 minutes from now so you just see a page that shows a blank video screen. I’d prefer to see the actual news article when I click the notification. Since the most recent update, the app kicks off after about 10 minutes and continues to kick off. It is very unreliable. .
Had to delete app as WBZ radio is gone. Sad! The CBS Local Boston no longer has WBZ 1030 radio!!!! Wbz Boston will not stream anymore for some reason. All my other favorites are fine, but that one won’t play and it’s really the only news station I listen too. Very bummed! Once CBS Radio stations are sold and not present on the app. I won't need it anymore and will delete it. This app has continued to give me error messages to "try again" when I attempt to move viewing from my iPad to tv. Tonight I tried just viewing from my iPad and for 15 minutes I got nothing but commercials. The news never came on, just commercial after commercial, then repeating the same commercials. Very frustrating and absolutely worthless. Every freaking video has an over 1 minute ad every time. DELETED. I'll stick to FOX News. Great app but buffering is annoying but love the app other than that .The music is great. Please make it better. It is still great music but still needs bugs worked out! Still needs a little work! But I love the music! Still love the music! Needs a little work! !Great app but still needs work! Needs more work and bugs worked but I love the music! More greedy CBS BS. Ads before everything! And unstable. Buggy app, crashes a lot, and makes you watch too many apps. Just skip it and get your news elsewhere. Would give zero stars if I could. 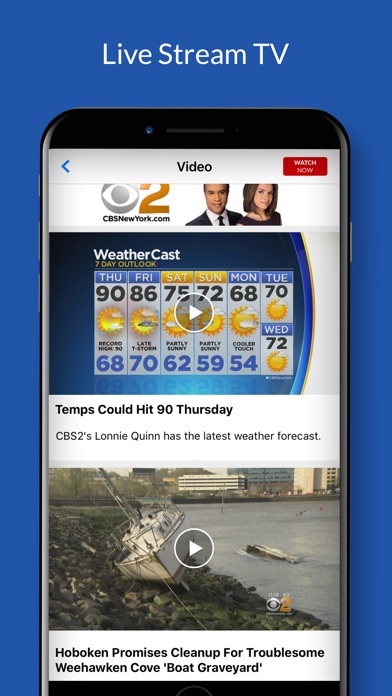 CBS Local: Like just about everything to do with CBS lately, the app is awful. I go to a new story to see a local NEWS VIDEO. But CBS, you greedy idiots, have to play an advertisement first. OK. The ad plays fine, and then the news story starts, and hangs about 10 seconds into the story. After a long pause, the app crashes. As usual. Bad enough, but when it relaunches to the story again, I have to watch the ad again. Seriously? Could you get any greedier? And before EVERY short news video! Give us a break from ads. But I suspect this will be a paid app soon anyway. First CBS All Access where you have to pay to stream WITH commercials. You are the only network that when one subscribes on cable or satellite, they still have to pay extra for the streaming service. You hold your channels hostage on Dish for more money, costing subscribers more. 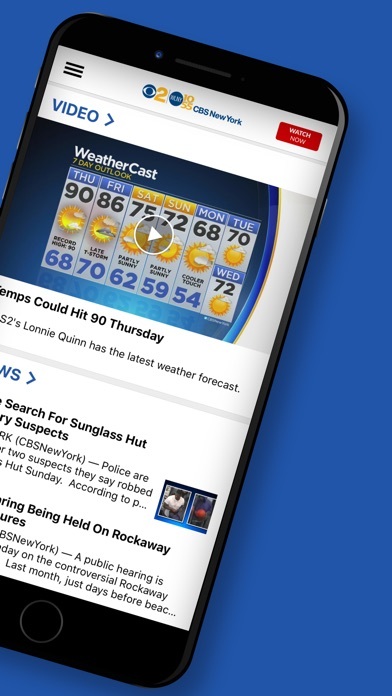 Now, ads before EVERY news video in your local app, where that video is usually shorter than the ad. Why not just come into my house and steal things while your at it? Oh, and feedback inside the app? IT STILL DOES NOT WORK! The app feedback email ALWAYS says try again in a few minutes. Seriously, are you guys for real? If you don’t want feedback, remove the button at least. App deleted! EVERY time there is a breaking news story notification, this app NEVER actually takes you to the correct story if you click on the notification. It always simply takes you to the app’s home page. Also, way too many ads before videos for my taste. Where's the news?????? The investigative story is duplicated and has run for days as well... If you gave up, just shut it down already!!! Thanks for all the hard hitting puppy stories. What happened??? This app is unnavigable. Fix this!! The live streaming video of the newscast seems to nothing more than a frozen image of the White House. I've sat through the stupidly long California Walnut commercial three times and still the show does not stream or even appear. But to make the issue even worse, I've also tried to send an email through the "contact support" option well over ten times now. I continually get a "try again later error". Should I try a different support line to figure out why I can't contact support? I have deleted and re-downloaded the app, which is still the same version, 2.2.10. As President Trump would say, "#Sad." Woman trying to put gas in her car is not even mentioned on this site at this time after is been on the news. I live around the corner from that and I had just gotten home before that happened. I don’t know why it’s not mentioned but praying for the lady and hope she turns out to have a full recovery because that is a dangerous road and up to that area at night there are no lights and if they’re speeding it makes it even worse and so many people that ride that road are not aware of it & appears to be scared to even drive. I drive it every day at least two and three times a day & I know every crack and cranny in that road. I thought I could watch a few TV shows on this app, but no.